Come on! Summer vacation in the Maoi, there were many inquiries for our call, from those in the inquiry, 15 junior high school students, a mother and one-year-old infant, and two senior women took part in this program. 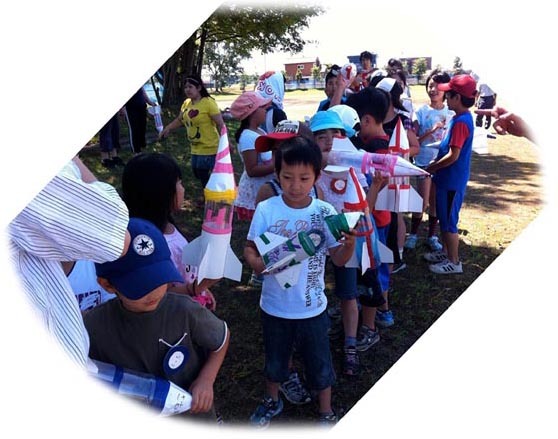 Hometowns of the largest number of the participants were Kooriyama city, and next Fukushima city and then Iwaki city. Postponed to the family at the station in Fukushima, children who started the journey of 16 nights and 17 days seemed to have been spending one night at the ferry boat in tension to the new things from this anxiety, and loneliness being away from their parents. However it has participated in many cases brothers and friends, in fact the children might also have the same school or same lessons group, and familiarity had become to think about came from the same school because it was able to open up to each other by the time arriving to Tomakomai port in Hokkaido. On the small lawn of the "Michi-no-Eki or the Station of Road", we stopped on the way to Naganuma from the ferry port by bus, was everyone running around in a bath of sweat. According to senior women who were accompanied by, the grass in particularly high radiation, and the children were to stay away from try to avoid for that reason. When we arrived in town Naganuma, and stopped by the town office, everyone in the staff welcomed us side by along the passage of the mayor chamber officials, and then we were listening to the mayor's welcome speech sitting on the worthy sofas in the mayor's room. The children had to answer to questions of the mayor called "What do you want to do in Hokkaido?" and "We want to play full". That state has been introduced in the Sorachi area version of Hokkaido Sninbun Newspaper. Orientation was then cared for three days two nights at the Seihouji Buddhist Temple in the town of Naganuma. Supporting members of this temple and people of town welcomed visitors from Fukushima Prefecture a lot, helped them as true, including support for meals and play. They have welcomed and took a hot spring bath with a grant from the town, and invited to Tanabata Festival or Festival of the Weaver, or Star Festival, or Vega Festival of Commerce Chamber, and received free bus tickets. Some children had atopic and could not sleepy well, but they were playing well to go outside during the day. Who took care of it representative of the Executive Committee of this time was the wife of the chief priest of this temple. Her skin was brown and tan to spend with children. From the third day stay in Naganuma, homestay, each of which would be divided into local farmers of Kita-Naganuma, was opened as a dinner meeting together of farmers and local people to accept. A young man from Menno-village who called to the local youth group, and they prepared meal, set the venue, so make children play games of fun and became warm handmade dinner party. In particular, farmers rely on their children stay in the quiz a scene at the farmers gather they think this was very sweet. Accepted farmers in the busyness of the farming season made the time and provided a loving home to children. During the homestay to farmers, by courtesy of the teachers from after-school care for children and the Board of Education of Naganuma, they were able to participate in the After School Care Program has been active in the elementary school building Kita-Naganuma. This program had come to care for children of local school, and also was allowed participating the children during this period who were not usually come to After School Care Program, Fukushima children were able to go to swimming pool, and play outside with them. I realized that the play is developed in increase the number of friends, to enrich the lives of children. After School Care Program is for children in elementary school and will not be home during day due to circumstances such as guardians(parents) work or job, refers to the nursery after school and during long vacations (spring, summer, winter) from school and do on behalf of the guardian. Sister Miki Mori of Yuai church from Sapporo participated in this program with her two children too, and also Sister Aoi Tamura and Sister Naomi Tamura from same church participated with Naomi's friends. 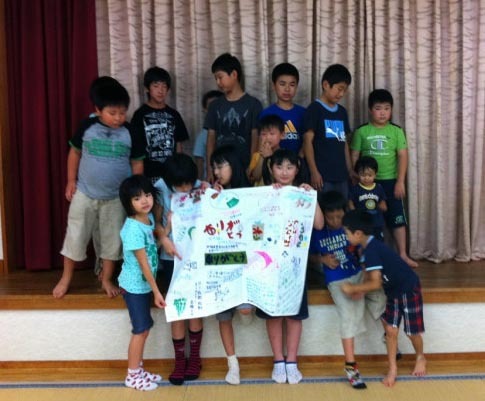 They instructed the Fukushima children to make "Picture Letter" sending to their families. Sister Yuko Murano of Yuai church from Sapporo came to make a delicious lunch with her friends together. With the cooperation of local people, Fukushima children were able to experience a lot of memories such as painting to pottery, to eat Nagashi Somen or Flowing Somen noodle, to observe the fireflies, climbing the mountain of Maoi, the play of the old days, Soba-Uchi or buckwheat noodle making, listening to the reading aloud of the books, cook the rice, and play to make a plastic bottle rocket. "Maoi" is the meaning of the hills and blooming Hamanasu flower or Japanese rose in the Ainu ( a former inhabitant of Hokkaido ) language. And Mt. Maoi is in the foothills of the eastern part of the town Naganuma. A variety of people that were involved in this program, each of them is to demonstrate the areas, which was also brilliant program. The first time, the children were playing outside as well regret a little while, and became a week time too, began to play in gradually settled down. They were practicing with local children many times transmitted to the Kita-Naganuma the "rice planting songs and dances". They presented to the local people wearing a costume, holding a Kita-Naganuma-Bon Odori festival on the ninth day. To dance the dance of the tradition was a total of 43 children, the children is decreasing in the region what would be the first time in years. It was a touching sight. We went out for a stroll in Sapporo city on the tenth day of the children. We ate Sapporo ramen noodle, toured the Environment Center in the Sapporo city ECO PLAZA and went to the Maruyama zoo. We have arranged the program that contains the learning element partly for serving as experience to ride a public bus and subway from Naganuma. In this issue of collective action was then highlighted. Without listening the warning, and to the actions of selfish, in the city lead to immediate danger, there were a few times each scene look back at themself about taking care of the children. We reflected on the sponsor side, was it good only provided fun for children to play simply? When they got home, because it is waiting for the reality of radioactive contamination, therefore, they need a self –management, to understand their situation, and caring other would be important. Although these programs was that in a short period could not be fully achieved, but I think the importance of outreach to them. I made me think or how to change the future of children through this experience. From the eleventh day, they are spending three nights and four days in the house of youth Takino in a suburb of Sapporo. Based on the reflection in the city of Sapporo, create a team of three, giving decided by each group leader and sub group leader the children. They were active mainly to keep the personal belongings tidy and keeping punctual for setting time. Three children have been brought despite the guide "Come put the game machine in the house" and after each of their thinking, they were passing the portable game machines as much share in the adults. Invigorating facial expression after they have finished passing was impressive. Through their own will to observe the basic discipline, I felt that they can spend pleasant, even fun to play concentration. I think on the last day in the Takino, taken sitting in a circle with everyone, and I want to talk the impression of activity this time. I want to tell the children that thinking of those who have been involved in fact, and people who have sent money even support from distant foreign countries. As the children in the disaster area but lived in a very real, I hope I want them to know that there is a prayer of many people to the children. That received the donation from the JMF for these activities of people who participated, as well those who have also transmitted in this region. Before implementation of the program now has more twist and turns, there were many times that I thought no choice to give up, but help new hand appeared every time a problem occurs, had gradually been developed as a result of encounters and rich ties. Little ones were used for, on the contrary, the power of many people is exhibited, initially, the programs that enhance appearance, could not have imagined was completed. During this period, I feel that is supported by many prayers constantly. We would like to thank on this occasion. A member of Sapporo Yuai church, and Secretariat of Executive Committee for "Come on! Summer vacation in Maoi"